The DR has been a rollercoaster. A difficult one. Only made bearable by the kind people we have met and have supported us along the way. We were feeling good after completing the Mona Pasage. Although physically knackered, even after a superb night sleep in our complimentary suite at Eden Rock, were were happy with the last couple of days and ready to take on the DR and any challenges it may have. Little did we know they would come thick and fast! The whole of the peninsular on which we landed is privately owned by Cap Cana and at the far end from where we landed is the Cap Cana Marina. Strictly, we should have gone straight there when were reached the DR coast as it is illegal to step foot on land without clearing customs at one off the nominated ports of entry. With a storm closing in we were forced to go straight to Eden Rock, which was dramatic enough in itself as outlined in our last post. Thus today our first job was to get to the marina and clear in. Luckily, we had been given our own golf cart to get around the impressive Eden Rock estate and the receptionist said this was the best way to get to the marina. It was a fun experience cruising down the road at 3 and a bit mph and within 25 minutes we had covered the 10km to the marina. I think they were a bit confused when we turned up in the car park requesting to charge our buggy (the battery was already in the red) and to clear in. Fortunately for us the Cap Cana marina is high end and fully geared towards customer service. The Dock Master, Frank, was superb and very soon (1 hour is considered pretty quick here) 5 different officials had turned up to clear us in. We think Frank did us a big favour by sitting them all down and explaining our situation - most find it pretty hard to comprehend what we are doing in a kayak and hardly anyone will believe that we crossed the Mona Passage! They would not clear us in without seeing the kayak so a few (Caribbean) moments later all 9 of us were piled into two small cars and driving back down the road we had just negotiated in the buggy to the little beach down a muddy track off the golf club where we had left the kayak. I think the local with whom we left the kayak got a bit of a shock when the two cars rolled in and all these officials jumped out. Alas everyone seemed to be content, our passports were stamped, and we were soon on our way again back to the marina to pick up the buggy, which had been charging, and head back to the hotel for some lunch and to get ready to continue our journey. Eden Rock really is an incredible place and we were very well looked after by all the staff and are immensely grateful for their generosity in letting us stay after the Mona Passage. If you are heavy heading to the DR, make sure you pay them a visit! The next morning it was back to the kayak after a speedy breakfast in the hotel. We got to the beach, packed the kayak, set off, returned to the beach, packed the stuff we'd left on the beach, set off again and were on our way. The 3.5 NM up the coast to the marina was slow against the current. We had to return to get a 'despacho' - naval permission to travel on the water, which is part of the DRs solution to battling drug and people trafficking. For cruisers and kayak expeditions it is a complete nightmare! Thank you Frank for taking us in and offering a fantastic dinner! Departure from Cap Cana lasted the best part of 10 miles. 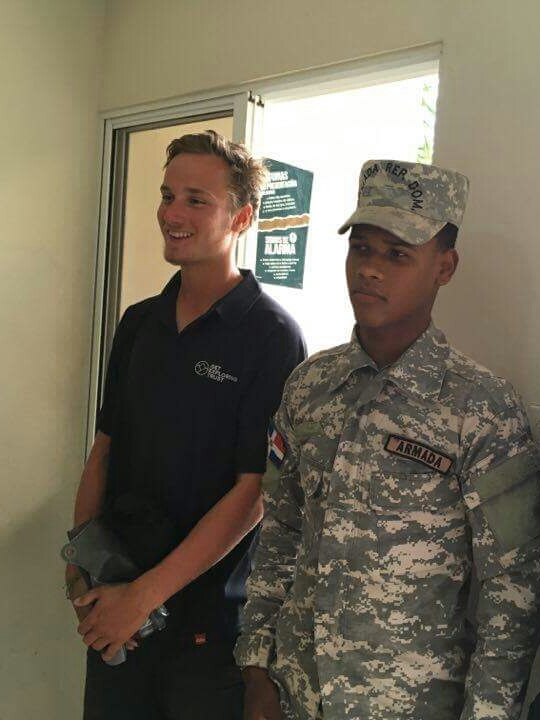 The Dominican Republic run a system whereby we must check in and check out every morning and evening with the military at their relative check points. As you can imagine, leaving at times between 1am and 6am depending on the days distance means obtaining our 'despacho' from the military is pretty much impossible. Add to that the incredibly slow speed at which anything gets done around here and we can barely move down the coast each day. Always take photos with officials, preferrably showing their name and rank, as proof for later on. So after a day's delay in Cap Cana we set off for Bavaro. Lela our host was fantastic, on arrival she sorted a safe storage place for the kayak and we then drove into the local town to begin the next fiasco with the military. Two hours later and we had our departure documents for the next day to move another 40 miles down the coast. A day that started with navigating a hugely treacherous reef in total darkness and then filled again with lightening and the ever growing realisation that we have probably used more than our 9 lives. From Lela we arrived in Miches where we moored the kayak up on Julbo's private dock and were kindly given a place to sleep and a meal for the night. Exhausted and hungry our first point of call was again the Miches military outpost. An hour later and still with no departure documents, we were told to return at 8am the next morning to collect them. Trying to explain that we can't leave as late as 8am to the military goes absolutely nowhere. Consequently we bunked down for the night and made our way over to the military in the morning. After a good hour of waiting we finally had our documents and rushed down to the boat to get out on the water. Frustrated, tired and feeling pretty down we decided to crack on and arrive in Las Galeras before darkness. The day started well, we paddled hard for the first 10 miles aware of the line of rain clouds to our right. The forecast predicted no thunderstorms. The forecast was wrong. When we were half way through the crossing the clouds suddenly grew more ominous, but with no option other than to continue we carried on hoping to duck behind them. A couple of miles later and a crazy bright flash of lightening filled the air immediately followed by a huge crash and rumble. It was directly above us. We've all too regularly mentioned thunderstorms crossing our paths in the last couple of weeks but it's fair to say this was a completely different story. I'd highly recommend checking out our following post on lightning storms to see the full dangers and recommended procedures. This time there was no option but to go into survival mode. We sent a warning satellite message to Exped HQ in case we were later incapacitated, placed our kayak paddles (essentially carbon fibre lightning conductors) in the water as far away as possible, got as low into the boat as we could, covered our ears with our hands and frankly hoped that it would pass over as quickly as possible. About an hour later and it had continued west. Shaken and pretty damn terrified we carried on with more clouds looming to our east. Zigzagging across the sea trying to dodge storms that are impossible to outrun or predict made for an exhausting and scary rest of the day. 'Survival mode'... what are your options!? We luckily made it to land at around 5pm, incredibly thankful nothing bad had happened. We're currently kindly being hosted by Marina, manager of the Villa Serena Hotel, in her house as our biggest set back to date has set in. With these storms forecast for at least the next 8 days we are running through all the possible options. We plan to let you know our plan of action as soon as possible!